Size of this preview: 800 × 531 pixels. Other resolutions: 320 × 213 pixels | 4,288 × 2,848 pixels. 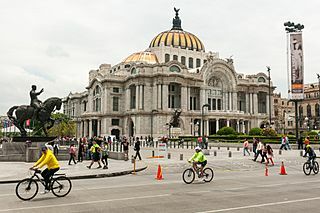 Description: Palacio belles Artes, Mexico D. F.
Permission: Dieses Foto ist von Ralf Roletschek Achtung: Dieses Bild ist nicht gemeinfrei. Es ist zwar frei benutzbar aber gesetzlich geschützt. This photo was created by Ralf Roletschek Note: this image is not in the Public Domain. It is free to use but protected by law. Entweder wird der Hinweis entsprechend der Lizenzbedingungen angegeben oder wie folgt: Ralf Roletschek / fahrradmonteur.de in unmittelbarer Nähe beim Bild oder an einer Stelle in ihrer Publikation, wo dies üblich ist. Dabei muß der Zusammenhang zwischen Bild und Urhebernennung gewahrt bleiben. In jedem Fall sind Urheber und Lizenz zu nennen. Ein Link zu meiner Homepage ist erwünscht aber nicht Bedingung. Either the notice is given in accordance with the license conditions or as follows:: Ralf Roletschek / fahrradmonteur.de near to the photo or at a location that is common in your publication but preserving the association between image and credit. In any event, copyright and license are to be mentioned. A link to my website is much appreciated but not mandatory. Bitte lesen sie den vollen Lizenztext gründlich, bevor sie das Bild nutzen! Wenn sie Fragen zu den Lizenzvereinbarungen haben oder weniger restriktive kommerzielle Lizenzen wünschen, kontaktieren sie mich per Mail: ralf@roletschek.de Please review the full license requirements carefully before using this image. If you would like to clarify the terms of the license or negotiate less restrictive commercial licensing outside of the bounds of Licenses, please contact me by email: ralf@roletschek.de This file has been released under a license which is incompatible with Facebook's licensing terms. It is not permitted to upload this file to Facebook. The making of this work was supported by Wikimedia Austria. For other files made with the support of Wikimedia Austria, please see the category Supported by Wikimedia Österreich. The making of this work was supported by Wikimedia Austria. For other files made with the support of Wikimedia Austria, please see the category Supported by Wikimedia Österreich. This page was last modified on 19 April 2017, at 15:34.